By Tim Truman, a public affairs specialist in the International Trade Administration’s Office of Public Affairs. Fred Lam, executive director of the Hong Kong Trade Development Council (HKTDC) was presented with the Peace through Commerce Award in recognition of his organization’s support of U.S. exports through the Pacific Bridge Initiative (PBI). 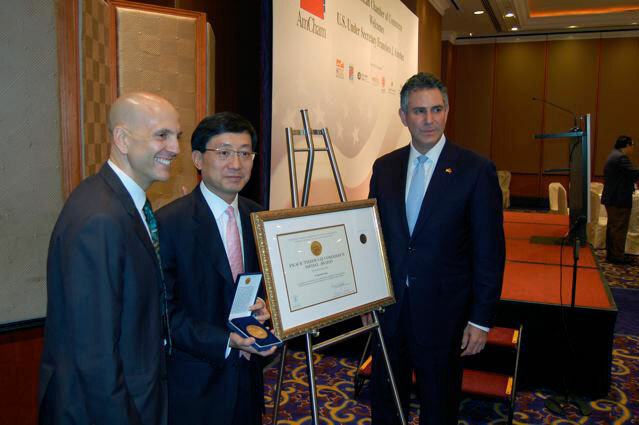 The award was made by Francisco Sánchez, under secretary of commerce for international trade, at a ceremony in Hong Kong on October 18, 2011. The PBI was introduced in 2010. It aims to leverage the existing U.S.-Hong Kong trade relationship to explore new markets, particularly in Asia and China, in support of the National Export Initiative (NEI). Through it, the HKTDC became the first government body outside the United States to promote the NEI on a bilateral basis. Since its inception, the PBI has helped triple the number of export transactions to Asia by new-to-market U.S. firms. The Peace through Commerce Award is a medal given to recognize an individual, group, or organization, either domestic or foreign, whose actions have significantly promoted and developed U.S. export initiatives, encouraged innovative approaches, and improved overall U.S. trade relations. It dates back to the first secretary of state, Thomas Jefferson, who commissioned the medal in 1790. Then known as the Diplomatic Medal, Jefferson awarded it to foreign diplomats who aided the Continental Congress during the American Revolution.